The Conway County Care Center is a 501(c)3 nonprofit organization located at 108 West Broadway in Morrilton, Arkansas. The Care Center was started in 1989 because the work to feed the needy was done by individual churches, and no one church could handle all the needs of the community. For the past 30 years, the Care Center has been faithful to meet individuals and families at their point of need. Our mission is to ensure that no one in Conway County goes hungry. We carry out this mission through operation of a food pantry and thrift store in downtown Morrilton. Stop by to visit, to find out more about our services, or to drop off your clothing and food donations. The Care Center’s thrift store is open Tuesday, Wednesday, and Friday from 9:00 a.m. to 2:30 p.m. and on select Saturdays based on volunteer capabilities. Revenue from the thrift store serves two purposes: (1) to provide decent clothing at low cost, and (2) to generate a portion of the income needed for overhead costs. All items are donated, and the proceeds of their sale is deposited to the general fund to help offset operating costs. The Care Center’s food pantry is open Tuesday, Wednesday, and Friday from 9:00 a.m. to 2:00 p.m. Food is available free of charge to Conway County residents once per month per household regardless of income. Our staff assists individuals and families in need by providing them with food from the Care Center's food pantry. Our food supply comes from the Arkansas Food Bank as well as from donations by the community. The combined support of churches, individuals, and local government allowed us to serve over 3,100 households, including 7,881 people, last year. The Conway County Care Center food pantry is a USDA/TEFAP provider and an Equal Opportunity Provider. 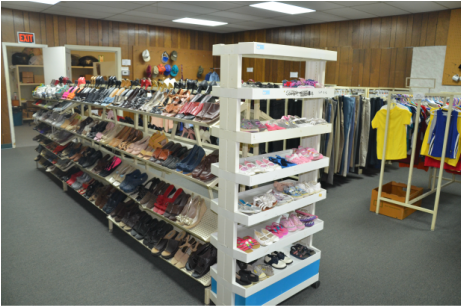 When people make donations of clothing, shoes, or household items, those items become a part of the Care Center Thrift Store. People can purchase items in the thrift store at a low price, and the proceeds help with the expenses of running the Care Center. When there is an immediate need, such as when someone's home burns, we supply them with items from our thrift store, free of charge.